The problem with being on holiday is the amount of catching up you have to do when you get home! 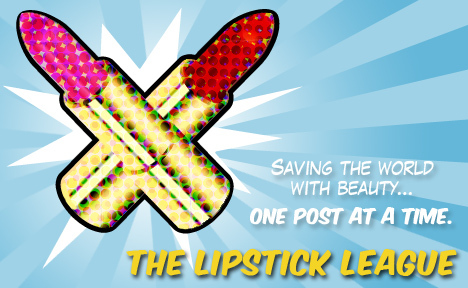 Apologies for the late posting of this week’s Lipstick League – hopefully I shall be back on track next week! What’s your signature lip color? Well, I guess it’s got to be red really hasn’t it? There are many, many women that wear a red lip with far more confidence than me but I don’t personally know any of them which makes red seem like ‘my’ colour to lots of people around me. Me? I still feel a bit like I’m playing ‘dress up’ in it… but that’s probably half the reason I love it so much! Lipglossiping – contemplates the best way to store her ever-growing collection of nail polish, thank flatpack for IKEA! Orange to LA – has a Liquid Eyeliner Showdown between her 3 favorite liners, who won? See the results, was it high-end, drugstore, or Japanese? Pink Sith – Gets nostalgic about lip color and her old flute teacher while telling you all about Giorgio Arman Rouge d’Armani Lipstick # 516. Phyrra – tells you about an awesome new hair product, Redken’s Radiant Sea Spray. we heart this – Ready to be blinded with hair science? Living Proof No Frizz shampoo and conditioner makes hair look scientifically better! Beauty Junkies Unite – gives you a sneak peek at the new OPI Pirates of the Caribbean: On Stranger Tides Collection that launches in May! Clumps of Mascara – shows the beauty behind one of the greatest places on Earth, Disney World! EauMG – reviews natural fragrances for Earth Week. Check out this “flapper” jasmine by LUSH. Nouveau Cheap – shows you five more shades of the amazing new Milani Baked Blushes and each one is prettier than the next. What’s YOUR signature lip colour? I think my signature lip color is coral. It just looks great with my skintone compared to any other colors.